Improv helps lives – no, really, it does! 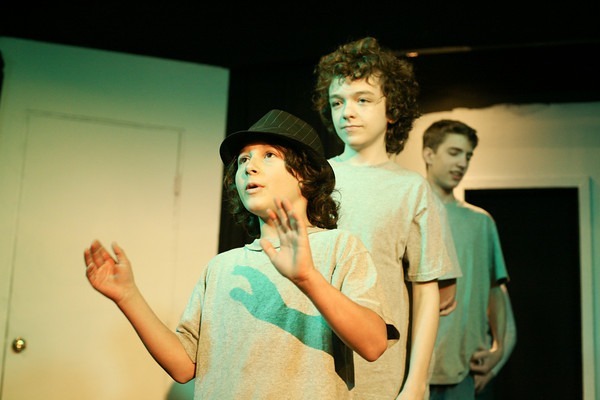 Kids who take improv classes at the Hideout Theatre learn how to hone their listening skills, express themselves creatively, work and play with others, take risks, and communicate effectively. We have programs for kids of many different needs – kids and teens on the autism spectrum, classes at homeless shelters, classes in schools for at-risk youth, and more. Every year the Hideout strives to give the gift of improv to as many kids as possible, including those who aren’t able to afford it. Every dollar received in donation to the Kids Improv Scholarship will go towards helping a child take an improv class, developing more special needs programs or other offerings to help kids with a wide variety of kids. 1. We were able to allow 8 kids to participate in mainstream summer camps or classes who otherwise would not have been able to afford them, including recent immigrants. 3. We continue to run a weekly improv classes in a shelter to bring enrichment, social skills, and a fun break to homeless children and their parents. 4. We were able to expand special needs programming to include youth and adults with other forms of neurodivergence. 6. We were able to discount show prices to bring our Hideout Kids show to rural libraries and schools, thus exposing kids from all over Texas to improv and interactive theater. 10. We were able to discount weekly classes for kids in a school that is typically underserved and economically disadvantaged. 1. Continue doing the good works from last few years. Whether you’re a veteran improviser who wants to give the gift to the next generation, or an audience member who just wants to give back to the community. We (and the kids!) really appreciate it. You can specify your donation amount on PayPal’s checkout page. Thanks again!